The 10 Best Road Races in North Dakota! Between runs devoted entirely to women and runs through freezing temps, North Dakota’s road races invite a variety of participants to lace up their running shoes. Along with the thrilling race, some events have live music and other amenities during/following the big event! The Roughrider State has races suited for all skill levels, and here are the 10 best. The Fargo Marathon is the biggest race in North Dakota. With over 20,000 participants, 40 live bands and DJs, the marathon is as much a community event as it is a race. The Fargo Marathon is a Boston Marathon qualifier. In addition to the race’s namesake, the Fargo Marathon also features a half marathon, 10K run, 5K walk/run, youth fun run, cyclothon, and the Furgo dog run. Although smaller than the Fargo Marathon, Bismarck’s race is also a Boston qualifier and has been one of the state’s premier races since its inception in 1981. Located along the Missouri River, the event also features a half marathon, 10K run, 5K run, and 5K walk. The home of North Dakota’s first marathon almost three decades ago, Grand Forks brought back the marathon last year, where it joined the race’s half marathon, 10K run, 5K run, and family fun run. That marathon course includes a stretch through some of the city’s original architecture, making it a unique race that is as beautiful as it is demanding. The marathon is a Boston qualifier. Roger Maris is Fargo’s favorite son and the 61for61 event is one of the area’s biggest fundraisers. The Home Run Walk is one activity included in a jam-packed weekend and it includes a 10K run, 5K run/walk, and youth run. All proceeds from the 61for61 event benefit the Sanford Roger Maris Cancer Center. Although Fargo may be best known for the Fargo Marathon, the Mini Marathon has come into its own in recent years. While the marathon is held in the spring, the mini is held in the fall, allowing runners to experience the beauty of the season while they snake their way through some of Fargo’s most beautiful neighborhoods. The event also features a 10K and 5K run. Nothing shows your running mettle more than race in the middle of winter—in North Dakota. The Frozen Feat event features a 10K and 5K individual run and a 10K and 5K lovebirds run. Is there a better way to show your love than running next to your sweetheart in zero-degree temperatures? 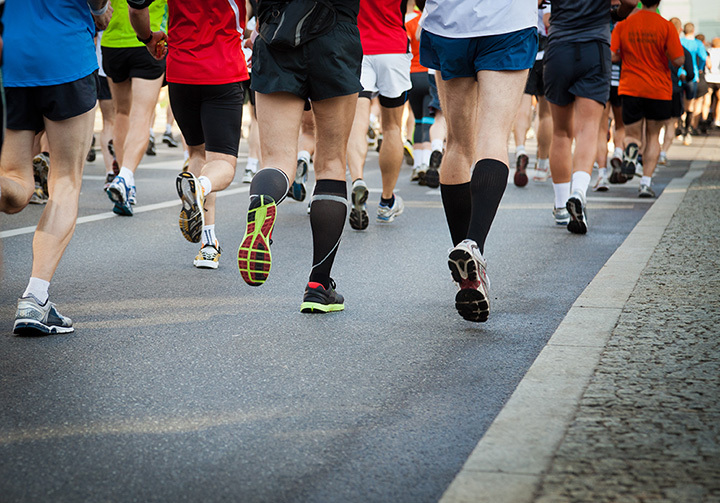 The Dirt Kicker Charity Run features a half marathon, 10K run, and 5K run/walk. Operating within a motto of “Make Your Run Count: Run with a Purpose,” the race is a charity event for The Ruth Meiers Hospitality House. The state’s newest marathon, the event features two days of races that will test even the strongest runners. Day one features the marathon, half marathon, 15K run, 5K run, and kids race. Day 2 involves the areas trails. Races include a 12-mile relay, eight-mile trail run, and 5K trail run. Want a bigger challenge than a marathon run on flat land, check out the Badlands Trail Run. Formerly known as the Badlands Trail Run, the race will take you through North Dakota’s Badlands, which means a variety of terrain that is often relentless and unforgiving. The event includes a 10K run, half marathon, three-quarter length marathon, full marathon, and endurance races of 54, 79, and 106 miles. The state’s only race devoted entirely to women, the Go Far Run was established to honor Dr. Renee Schwandt, an OB/GYN physician at Essentia Health. The event includes a 5K run, 10K run, half marathon, two-person relay, 12 years and under run, a Diaper Dash for crawling babies, and a Toddler Trot for youngsters under age four. All proceeds from the event benefit the Essentia Health NICU. View more North Dakota Road Races.